The MC will oversee several programs in the 2016 - 2017 season. The Kennedy Center moved to increase its engagement with rap today by announcing that Q-Tip will serve as the artistic director for a new series of events tied directly into hip-hop culture. Deborah F. Rutter, President of the Kennedy Center, issued a statement praising the initiative. "We are proud and excited to be incorporating hip-hop culture into our artistic and educational programs during the 2016–2017 season," she noted. "The history of hip-hop and its development as an art form, and the complexity and importance of its impact on the arts landscape driving social and cultural awareness, has inspired us to have a more formal connection with our ongoing programming." 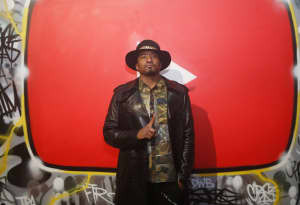 "With hip-hop constantly changing and evolving, it is easy to forget the history and legacy that precede it," Q-Tip added. "I want to begin at the beginning of the Culture to help people see its roots, better understand its present, and responsibly create its future." The Kennedy Center shared information on the initial group of programs that will constitute the Hip-Hop Culture Series. Read that below. Brave New Voices is an international festival and collaboration with Youth Speaks, a major spoken word organization for youth. The 19th Annual Brave New Voices International Youth Poetry Slam Festival will convene the most outstanding young poets from around the world for five days of workshops, slams, showcases, community service, and civic events. Part of the John F. Kennedy Centennial Celebration. A world premiere Kennedy Center co-commission with B-Fly Entertainment, All the Way Live! is written and performed by Baye Harrell and Paige Hernandez. Hip Hop performers collaborate on the spot to “remix” everything from folk tales to classical art. The remix unfolds through dance, poetry, improv, and rapping. In this interactive show, history is revived through the lens of Hip Hop in which anything can come to life with a simple beat, a rhythm, and a rhyme. Age 7 and up. Part of the John F. Kennedy Centennial Celebration. Presented by the D.C. Hip Hop nonprofit Words, Beats & Life, this event is designed to outline the tools and resources necessary to develop curriculum, programs, and work (artistic and scholarly) based on Hip Hop Culture. The Teach-In is intended for participants who wish to move beyond Hip Hop as a purely aesthetic art and use it as a vehicle to build organizations and to educate youth, families, and their communities through the arts. Part of the John F. Kennedy Centennial Celebration. Top Notch is a 3v3 b-boy (breakdance/street dance) competition and part of the annual Words, Beats & Life Teach-In. The event includes dance workshops and it represents an ongoing commitment to engage in Hip Hop. Part of the John F. Kennedy Centennial Celebration. Conceived as a reimagining of director D.W. Griffith’s infamously racist 1915 silent film, The Birth of a Nation, DJ Spooky’s Rebirth of a Nation is a controversial and culturally significant project that examines how “…exploitation and political corruption still haunt the world to this day, but in radically different forms.” Today, more than a century since the release of The Birth of a Nation, the project continues to be presented internationally, engaging audiences in themes of civil rights and freedom seen through the lens of DJ Spooky’s unique art of remixing. Originally commissioned in 2004 by the Lincoln Center Festival, Spoleto Festival USA, Wiener Festwochen, and the Festival d’Automne a Paris, the project has been performed around the globe. The Kennedy Center debut of Rebirth of a Nation will feature multiple live video projections and D.C.-based music ensemble Sound Impact. Part of the John F. Kennedy Centennial Celebration. /peh-LO-tah/ is a full-evening performance work linking the sport of soccer (often called “the beautiful game”) to local and global economic hierarchies, fan behaviors, political allegiances, and social practices. /peh-LO-tah/ layers poetic text, movement, visuals, and music into a fresh theatrical form based on Hip Hop aesthetics. /peh-LO-tah/ features verbally and physically energetic performances, ground in personal experience, while embracing social and global consciousness. Age 10 and up. Part of the John F. Kennedy Centennial Celebration.